I got crazy and cut a bunch of rings a couple weeks ago with the express purpose of making a few more Byzantine bracelets. However, I wasn't in the mood for the same 'ole thing and created a couple new versions of this popular chain .. with a twist. 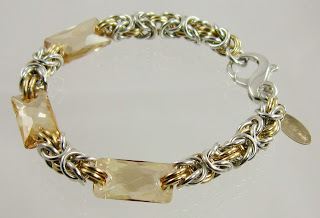 The bracelet in my previous post included a fabulous clasp I made from fine silver clay. This version uses a combination of sterling and 14k gold-filled rings to complete the chain. 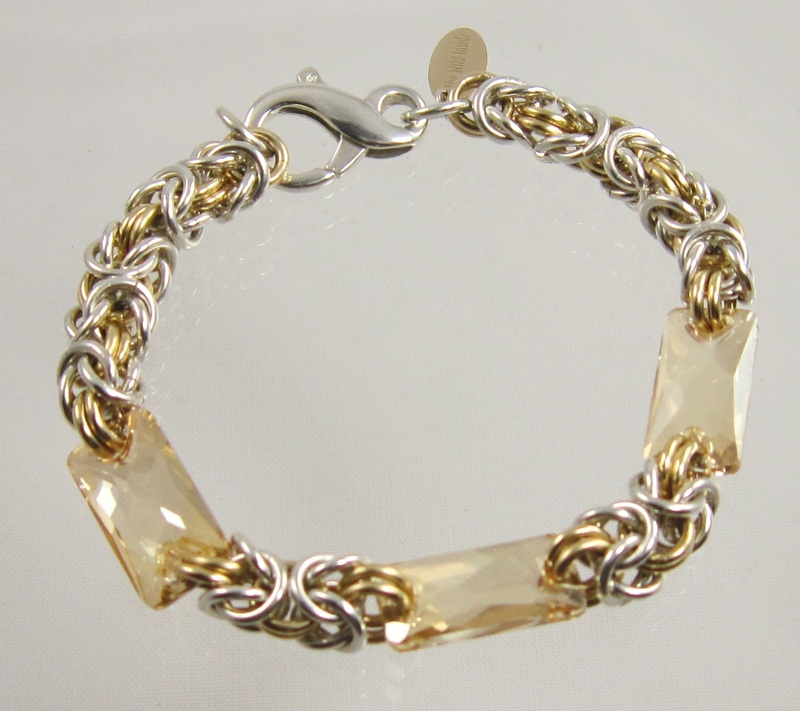 And to punch up the sparkle power I added a relatively new cut of Swarovski crystal to this bracelet. I was pleased with the result! I liked this one so much, I made two, slightly different, versions. The one below places the gold-filled rings in the two-by-two position .. the other version has the gold-filled rings in the alternative position (where the sterling rings are in this photo). Though the two bracelets look about the same side-by-side, the second version uses more gold-filled rings and is, therefore, a bit more costly. I have a tendency when I'm in the studio to just ... go .. with a design. I think of something that I believe will work, pull out all the materials, play around with it for a while, then put it together. Unless the design is something truly complicated, this process usually works well for me. However, it's generally not until after the piece is complete that I write up the material list and cost. As I have recently (and in the past) sold several expensive pieces, I don't worry too much about this. Though many jewelry designers are much more aware than I of what a piece will cost before they assemble it, I find that if I thought about that aspect too much, I'd probably never create anything. My only concession to this "make it first, price it later" type of thinking is my ongoing collection of tools and materials for polymer clay work (a much less costly material with which to begin a piece). Despite having played with a few simple polymer clay designs, I know in my heart that the types of pieces that will live up to my standards (and which I will be proud and happy to display for sale) will most likely take more time to complete than some of my precious metal and stone designs. The types of polymer clay pieces that have caught my eye are complicated little works of art that require some skill, made by artisans who have been working with the medium long enough to have acquired the necessary skills. So, while I continue to explore some of those skills in the books I've purchased on the topic, I can't help but continue doing what I do. Especially since I still enjoy working with precious metals, stones and pearls. Despite the high cost of gold and silver, I continue to purchase and work with these materials. They remain a good investment, both for creating and purchasing. I doubt silver will ever again be at the $4 an ounce price it was when I began this business adventure. And while I don't use quite as much "high gold" as I once did .. 14k, 18k, 22k, etc. .. 14k gold-filled materials are a fine substitute. I often find myself having to explain that an item (like this bracelet) made with 14k gold-filled materials is barely a step down down from a solid 14k gold item (and a huge step up from anything that's plated, which I would never use). Items made with gold filled materials are considered professional jeweler's quality. 14k gold-filled wire is made by forming a tube of solid 14k gold which is then "filled" with a base metal. The gold is bonded to the base metal with heat and pressure. The base metal is also gold in color and is made up of almost the same mixture of metals (usually a brass alloy) used to bring 24k gold down to 18k, 14k, 10k, etc. The exterior of the product is solid 14k gold, and everything you can see or touch is a solid layer of 14k gold. The gold layer on gold-filled wire is approximately 100 times thicker than gold plate - and because it is bonded with heat and pressure, it will never tarnish, chip or wear. While I occasionally still use solid gold materials in my pieces, using 14k gold-filled wire, chain and components allows for designs with the beauty and value of 14k gold at considerably less cost than a solid 14k gold piece. 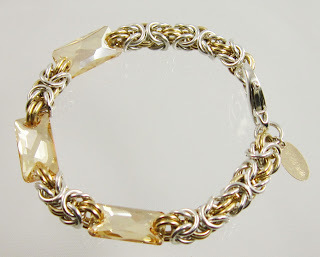 I would love to make an all-gold version of this bracelet .. but at the current price of gold (hovering just below $1,800 an ounce), even a 14k gold-filled version would be outrageously costly. So .. I compromised a little. I may even have to make one of these closer to my size to go with the one or two other gold and silver pieces I regularly wear. Combo pieces like this bracelet go well with both silver or gold .. though the crystals on this design punch up the overall gold flavor considerably. It's a lovely piece! Hi, It's so lovely bracelet and I would love to say that beauty brings beauty and above piece is expressing your beautiful thoughts regarding jewelry. I think it can really make any hands beautiful and feel the gold.